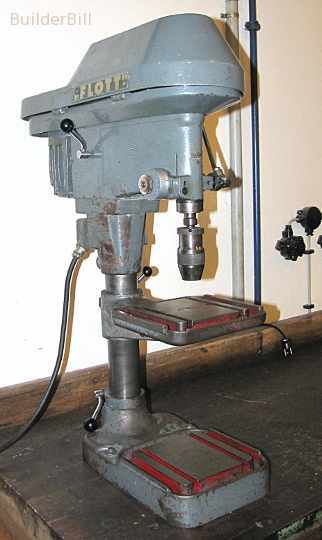 A drilling machine either floor or bench mounted. A rotating vertical axis holds the drill bit and it is lowered into the work usually by a hand operated lever. A good quality old drill press mounted on a bench. The shaft is clamped to the base but it has the facility to rotate if needed. The base of the machine is usually bolted down firmly. The head of the machine carries the motor and the drill mechanism. The work table can move up and down on the shaft to allow for different depths of material and depths of drilling. Modern machines have safety switches, light and guards. The top cover contains opposing sets of pulleys so that by changing the belt positions different gearing or drill speeds are selected. Presses come in many shapes and sizes and a range of qualities. I once had a cheap as chips Chinese bench press that was a copy of something like the one above. I used for on site drilling. It chattered like hell being lightweight and flimsy. It always suffered from from belt slip and the motor really wasn't up to the job we used it for, which was drilling mostly odd mild steel cleats and angles. Usually we drilled pilot holes first and then up to 18mm diameter in 6mm thick plate. Bad as it was this press was worth it's weight in gold for the work that it did. 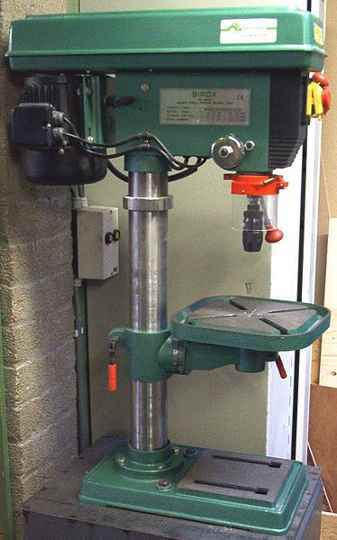 It is many many more times efficient to use the cheapest of drill presses than to struggle with a hand held electric drill. These machines lend themselves to repetition work very well. It is simple to make up a temporary timber base with stops or jigs attached that can speed up and increase the accuracy of many drilling tasks. Machine shops of course have a range of machines to choose from, but for the most part the metal shops that do smaller fabrication jobs for the construction industry end to use hydraulic punching machines to make the holes in weld on cleats etc.